COLONIE – Rita J. DiDomenico Renaghan entered eternal life on her 81st birthday, Monday, September 3, 2018 in her home at The Beltrone Senior Living Center in Colonie, NY . Rita was born in the Bronx to the late Eugene Louis DiDomenico and Josephine M. Tomaso DiDomenico. She was employed as a unit supervisor for the Associated Hospital Service of New York until 1962. She devoted her life as a nurturing mother raising her five children in Bronx, NY, Roanoke, VA and Clifton Park, NY. Rita was also a Columbiette of the Knights of Columbus, and received great joy from music, dancing, and Siberian Huskies. 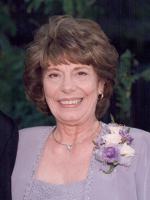 Rita was a loving and devoted wife of almost 55 years to the late Patrick E. Renaghan. She is survived by her children Robert P. Renaghan (Cheryl D.) of Charlottesville, VA, Patricia A. Page (Thomas J.) of Wilton, Mike E. Renaghan of Latham, Kevin G. Renaghan (Teresa York) of Albany, and Kathleen T. Westlake (Michael A.) of Auburn; her brother in law Robert B. Renaghan of Weeki Wachee, FL her grandchildren who she was ecstatic over, and who brought her much joy and love, Meghan R., Holly A., and Michael J. Page; and by several nieces and nephews. She was precedeased by her sister Dolores M. Renz. Funeral services will be held in the Hans Funeral Home, 1088 Western Ave., Albany, Friday morning at 9:00 a.m., and from there to Christ Our Light Church, 1 Maria Drive in the Town of Colonie, at 10:00 a.m. Relatives and friends are invited, and may call at the funeral home Thursday from 4-7 p.m. Interment will be in The Gerald B. H. Solomon Saratoga National Cemetery, Schuylerville, Friday afternoon at 12:30 p.m. In lieu of flower, memorial contributions may be made to American Cancer Society. To leave a message of condolence for the family or obtain directions to the funeral home, please visit www.HansFuneralHome.com . Rita has been a very dear friend from the very first time we met. Our sincerest condolences are sent to all her family. Our thoughts and prayers are with you and your family at this time. We’re so sorry for your loss. Please let us know if there is anything we can do for you! Sending love and positive thoughts your way!